Microsoft Excel must be installed on your PC in order to complete this step. In this step, you will create an Excel spreadsheet and modify the host configuration file SendCVSFile.lih to allow the User Agent to use an Excel file (.xls) as source, instead of a .csv file. The User Agent will read the spreadsheet and display the contents. It will then send the data to the Server in CSV format for processing by function iiiFN03. Function iiiFN03 will return a response to the LANSA User Agent. 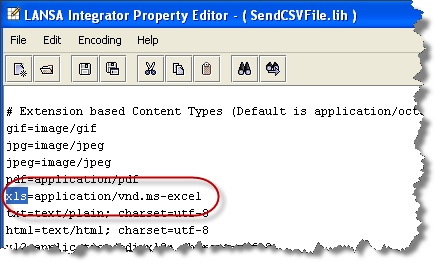 Function iiiFN03 must have a SVMODE(*IGNORE) keyword on the RECEIVE command, since the Excel spreadsheet will be defined with column headings which are not field names. If necessary, you should change function iiiFN03. First, you must create the file containing the data to be sent using the User Agent. The file contains a list of employee numbers and the new salaries for those employees. 1. Start Excel in Windows. 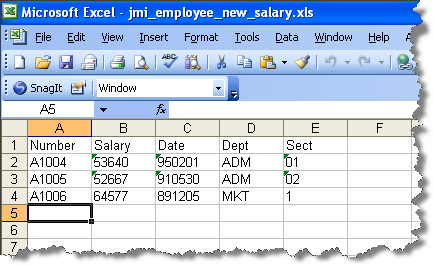 Format cells E1 to E3 as text prior to entering the values, otherwise Excel will treat the entered values as numbers. Column headings should be included in the Excel spreadsheet. Your function assumes headings exist and ignores them. Note: this also means that without a column headings row, your function would ignore the first row of data. Ensure that the employee identifiers in the EMPNO column (A1004, A1005 and A1006) exist in file PSLMST in the partition where the server side RDML function will execute. (If the data does not exist in PSLMST file, substitute employee identifiers that do exist.) Enter the remaining data as shown. 5. 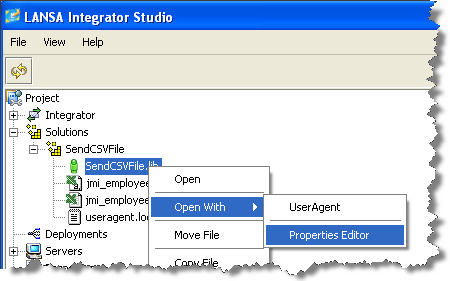 With your iii Training project open in Integrator Studio, open the SendCSVFile.lih with the Properties Editor. 6. Use Find to locate xls entries. You should find the highlighted entry already exists. This line defines the Windows application which the User Agent will use to display an .XLS file. 7. Locate entries for uri and modify the entry for xls.uri=/cgi-bin . . . as shown in the screen shot. This defines the service which the JSM will look up in DC@W29 to find the program or function to call when handling an xls file. 8. Add a new section to the end of the configuration file, to tell the LANSA User Agent which of the sheets in the Excel spreadsheet to read and what to convert the spreadsheet to, prior to display. 10. 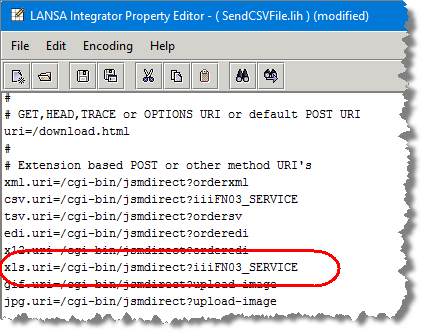 As before, open the User Agent for your SendCSVFile solution, open the Excel file iii_employee_salary_amendments.xls and send it to the JSM server. The response should be the same as before.